This is a sample plug to show the different reporting functions available. Keep in mind no analysis is done in this Plug! Above screenshot shows how the Report looks like for the above Analysis code. Every Analysis Plug has it's own analysis container called 'Report Island'. How to change Author Name in the Analysis Plug 'Report Island' to get credit for your own Analysis Plug? Above screenshot shows Assembly Information window and where you can set Author details. I have addressed few questions below, but if you have any other questions or concerns, feel free to ask through comments. Q. If I throw a Kitchen sink at Debug Analyzer.NET, will it analyze it for me? Kitchen sink is not supported at this time. Q. 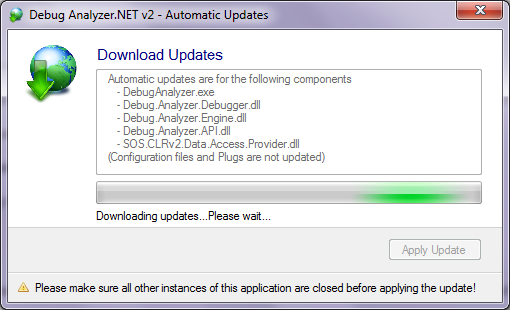 Can we use Debug Analyzer.NET to do live debug? Debug Analyzer.NET is a memory dump analysis tool and does not support Live debugging. It's a non-technical decision since you already have tools like Visual Studio, Windbg etc available for that. Q. Can we use Debug Analyzer.NET for debugging native memory dumps? Current version of Debug Analyzer.NET supports analysis for .NET and few related commands from native world under Analyzer.DBG. Support for Native scenarios will be provided as and when required. This would be more to help the managed debugging rather than full fledged native support for now. Q. What versions of CLR are supported by Debug Analyzer.NET? Current version of Debug Analyzer.NET supports analysis for CLR v2 (and 3.x). CLR v4 support is coming soon after the initial release. Silverlight support is also planned. Q. Will Debug Analyser.NET support CLR 1.x memory dumps? There are no plans to support .NET 1.x since its usage is very low and not worth my personal time. Q. If I write Analysis Plug, how do I get credit for the usage? Analysis Reporting Framework uses Plug 'Assembly Attribute' called 'Company' to show Author name in the Plug footer. You can add your name or website to show up as Author there (no HTML). Q. 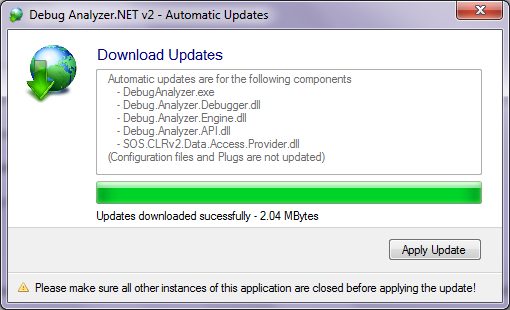 Why is Debug Analyzer.NET current release numbered as V2? There was a V1 version of Debug Analyzer.NET which was released to showcase the idea of how analysis can be done using Plug Framework. Current version is improved with a redesign of the architecture, implementing a Provider Model and Data Access Components. Also several features were added, one of them being Instant Analysis. Q. 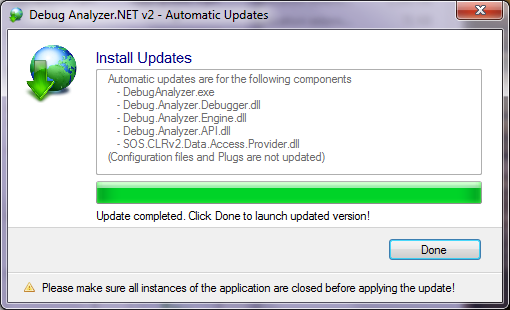 After completion of Debug Analyzer.NET v2, then what? I have a complete roadmap prepared for v3 and would love to continue working on it. I will be publishing the roadmap sometime in the future. Q. Does Debug Analyzer.NET contain bugs? You bet, it would have bugs since it's built by human (yours truly). I have also provided Diagnostic Tracing, configured through config file to get more information about the bugs, as and when it happens. Q. What is the easy way to learn to write Analysis Plugs? I'll be blogging more about analysis with samples as snippets which you can use from Instant Analyzer. Also all the built-in Analysis Plugs source would be shared through Codeplex project for your learning pleasure. Since the flow of the Analysis is same as what we do manually, you can learn debugging in Windbg with sos/psscor if you know how to write Analysis and vice versa. Let's see step-by-step how the Application Update works with screenshots. Keep in mind at this time you need to manually trigger the update process. And this would be the case during the Beta timeframe. Updates downloaded and ready to be applied. Debug Analyzer: Bringing back the dead!